Talk about your rural roots! 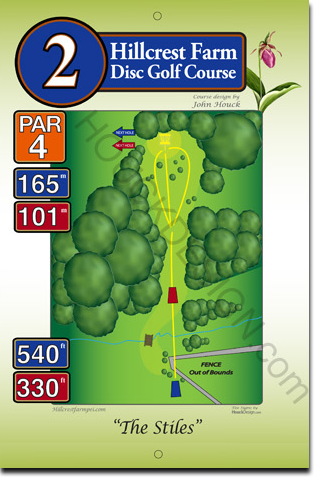 This par 4, 165 metre fairway starts off with the long tee above the corner of a cow pasture. (Don’t worry, there’s a stile to get over the fence if your disc should happen to fall short into the pasture!) The approach goes downhill and across the brook, where the red tee is located, then the fairway narrows uphill through the spruce trees to a clearing. The basket is on the far side.